If you or someone you love sustained injuries as a result of another person's negligence, you can turn to our attorneys for help pursuing personal injury or wrongful death compensation. 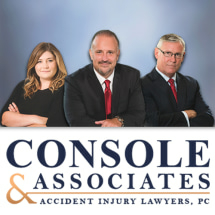 Our attorneys understand the toll accidents take on victims, and they will work diligently to ensure justice for your case. If you would like to learn more about our law firm, you can take advantage of our offer for a free initial consultation at our Marlton law office. Law Offices of Richard P. Console, Jr., P.C. If you or a loved one has been injured in a school, public transportation or school bus accident, contact our office immediately. If you or a loved one has been injured in a car accident caused by another person's negligence, we can help. Although all vehicle accidents are capable of producing personal injury and death, truck accidents have a particularly lethal potential. If you or a loved one has been injured in an accident as a pedestrian, contact our office immediately. Because taxis transport millions of people each year, accidents occur frequently, and even a minor fender bender can result in serious injury.